June 16th to 30th 2018. 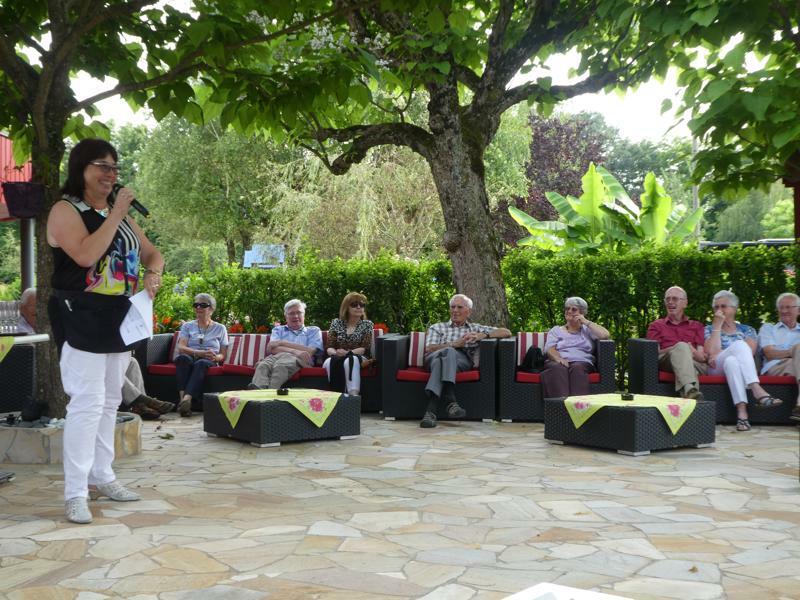 On a bright, sunny day, we all arrived at the lovely site, La Coin Tranquille, chosen by our Rally Officers, Ted and Jan Elgar together with Trevor and Sue Crowther. As we turned into the beautiful colourfully floral entry of the site we were heartily greeted by Ted who directed us to the pitches assigned to the rally. 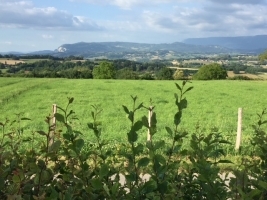 These were all together in a part of the site that had magnificent views over the surrounding countryside and were spacious and shady. It was an auspicious start to what turned out to be a fantastic two weeks of good cheer and peaceful relaxation. 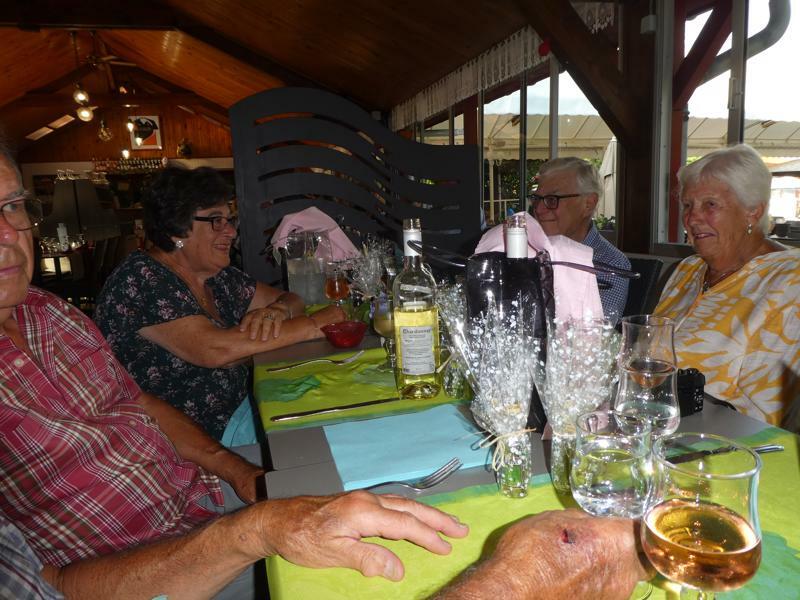 That evening we were treated to the first of the excellent meals provided at the Campsite Restaurant as our Welcome Meal. And what a welcome it was! All the staff, lead by Martine who is one of the owners and managers of the site, turned out to greet us and be introduced including the youngest member of the family who was only a few weeks old! This welcoming, and the helpful attitude of all of them pervaded the site creating a wonderful atmosphere. 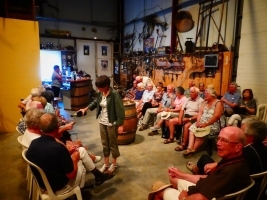 We were plied with generous amounts of the local alcoholic products throughout the evening, together with a delicious and very generously portioned meal! It was a lovely start to a great rally. 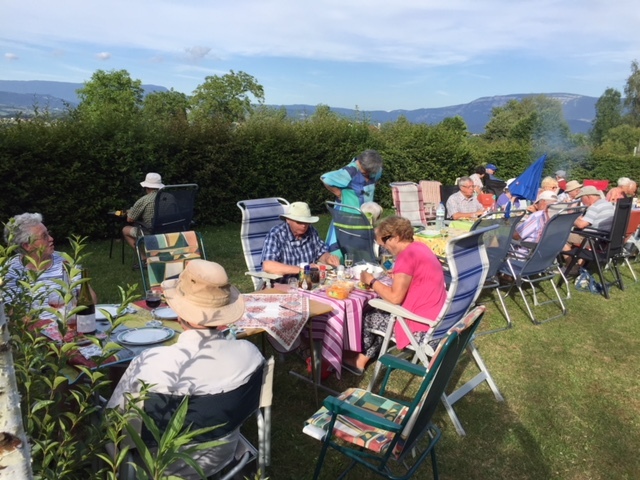 Over the next two weeks we had many happy “Happy Hours” where most of us tried to keep in the shade, due to the wall-to-wall sunshine. The Rally had an excellently well-balanced programme of free days interspersed with a couple of outings, optional organised walks and of course the Boules Competition. 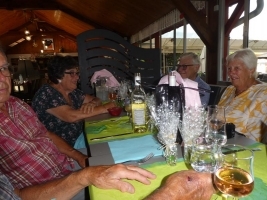 Likewise in the evening we had a couple of communal meals as well as the Welcome and Farewell dinners. The first outing arranged caused us great hilarity, as in order to visit the local Pascal Brioche factory, we were required to conform to their strict rules about what we wore. No open shoes, no jewellery, bags, phones or cameras were allowed into the food processing areas. We all had to wear protective overalls and head covering. It was amazing to see how the mechanised processes functioned and the speed at which the whole procedure was carried out. We were all rather dismayed to see how much food was wasted just because it was not absolutely perfectly formed. We hoped it wasn’t thrown away just for that, although this did appear to be the case. We couldn’t take photos at the time, so it was arranged that we should dress up again for a photo shoot at the next Happy Hour. This caused the other visitors at the campsite some amusement! One evening we all attended the campsite’s Barbeque Evening, which was a feast with entertainment. The musician performing was a very good singer and kept up a non- stop performance for over 3 hours. Sometimes his music was over amplified and that was distracting for a number of us who find it difficult to talk against a loud background; however he was very entertaining and the evening ended late with dancing to his music. Some of our more energetic members danced happily for over 30 minutes, showing the younger people there that age is no barrier to having fun! In fact it was the oldest people there who were the most active! 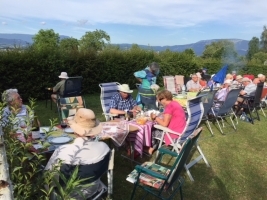 Another evening we enjoyed a communal BBQ, sitting together in the late evening sun. Our one big outing was a coach trip around the area with a local guide. We started with a visit to the fascinating Shrine of Our Lady at Myans. 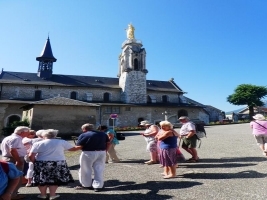 The church became famous for a miracle that occurred there in 1248. 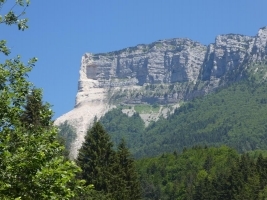 That year a tremendous earthquake shook the region causing Mont Granier, the tallest mountain of the Chartreuse Massif, to disintegrate into huge boulders which came crashing down into the valley. 16 villages were crushed and 5,000 lives lost. The church of Myans, however, was spared, when gigantic boulders stopped abruptly at the very door of the church. Some of these boulders can still be seen around the church grounds. After this we went to a local wine producer for a tasting of 4 of her wines. Abymes, Apremont, Rose and Cremant! This set us up nicely for our lunch in a delightful hotel in the shadow of Mont Granier with stupendous views of the surrounding countryside. 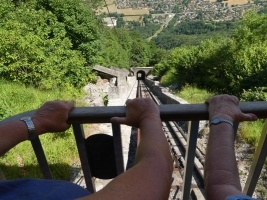 Having been wined and dined in style we set off for the final visit, which was up a funicular railway to Le Touvet, a twenty minute ride on an almost perpendicular slope! Some of us were very glad to be back safely on the coach! This trip was really varied and enjoyable and we all came back tired but elated. 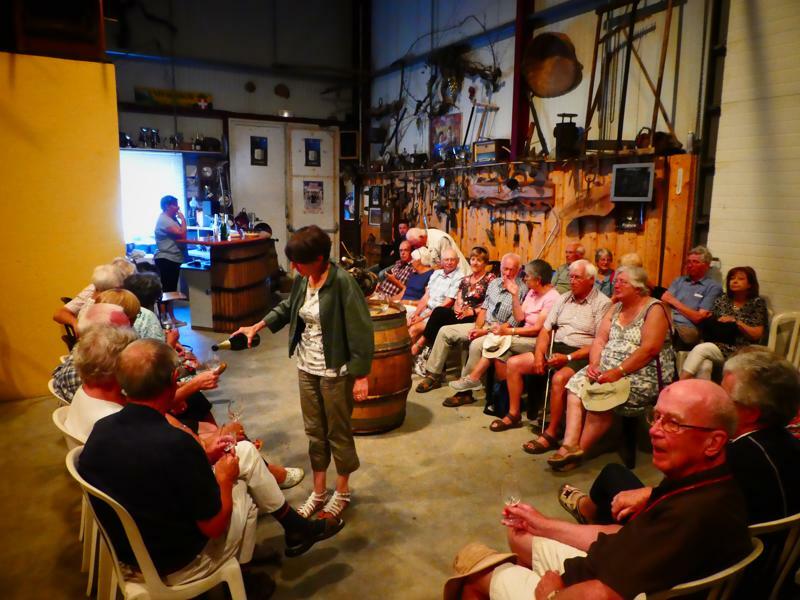 On several days the Boules competition kept us entertained. It ended with a very close final between Phil and Val Steele and Trevor and Sue Crowther, who eventually managed to win. Our minds were also exercised by the two competitions we had been given. Many of us also exercised in the lovely swimming pool, which was also a way to keep cool during the day, as the weather was wonderfully unfailingly hot for the whole fortnight. All too soon, the penultimate day came round. Before the Farewell Dinner in the evening, many awnings had come down and vans prepared for take off early the next day. The Dinner was again at the campsite Restaurant, which is easily the best restaurant in the area. Plentiful food was again in evidence, including this time, two puddings, one after the other, as we were also celebrating Mike Potter’s birthday! Speeches made, prizes handed out and thanks echoed around the room, particularly for the Rally officers who had organised a most relaxing but fun rally. 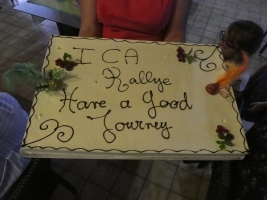 All good things have to come to an end, but we will all remember our great holiday in the Dauphine, thanks to Jan & Ted, and Trevor and Sue whose hard work and dedication really succeeded in making a fantastic rally enjoyed by us all.